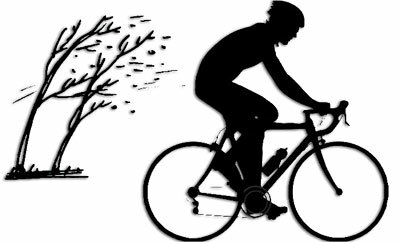 Headwind can greatly reduce the speed of bicycle while tailwind sometimes not so noticeable. But the average rate of “back and forth” is still falling. How much it because of wind? 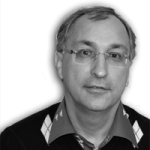 Let’s consider small task, despite the simplicity of the solution it seems paradoxical. Cyclist usual speed of whom is 25 km/h, went to ride on a windy day. 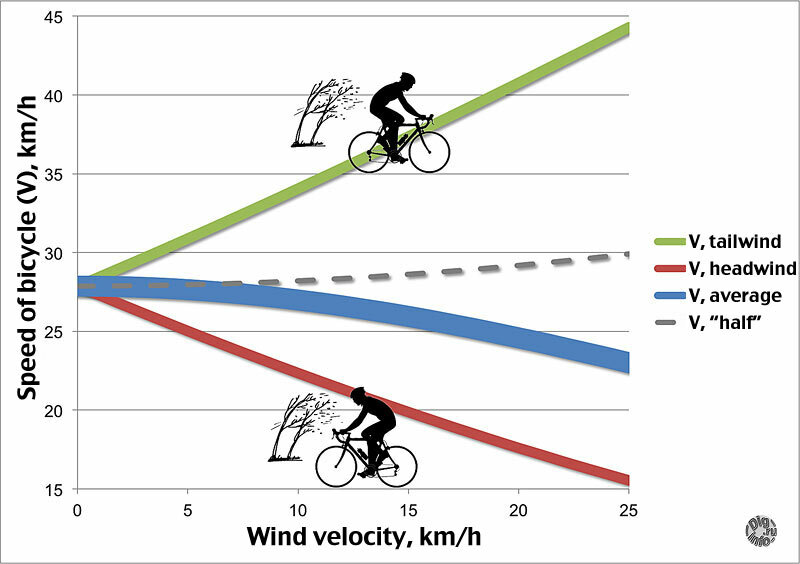 First, the wind blew against movement and speed of cyclist was decreased by 5 km/h to 20 km/h. Then he went back and tailwind increased the speed by 5 km/h to 30 km/h. What is the average speed of a cyclist for the whole trip? It would seem that there is nothing to solve and of course the average speed should be the same as 25 km/h, as in the absence of wind. After all, the wind acts very “honestly”, at first wind turned down the speed but then added the same speed. Unfortunately, the average speed is arranged “unfair.” The average speed falls easier than increasing. Solution of the task: 24 km/h, that is from the normal speed of cyclist somewhere disappear 1 km/h. 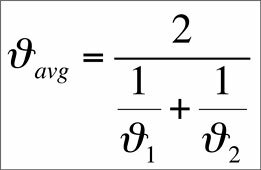 This is the formula for an average speed (in sum of reciprocals). Task about the cyclist could be still worse, he could pass halfway against the wind at a speed of 20 km/h and then return back immediately, “through the portal” 🙂 But the average speed will be only 40 km/h. Is it fault of wind? Simulation speeds for 200 watts pedalling power (with the same data as in note about ride on hilly terrain) leads to following graph. How to ride against the wind? The network has some advice, but in my experience you just need to endure. Unlike the hills when it is possible somehow distribute the effort if you see or know the height and slope, it is nothing to say about wind. When wind finished is not known. Besides, it has the ability to blow along the curves of the road. Now I’m going against the wind as well as up the hill, at a reduced cadence. This is because so the force on the pedals is more bind to changes in wind and terrain. You also need to consider that the inertia (kinetic energy) at reduced speed is lower and therefore it also easier to compensate the lack of inertia by additional forces which easier to find in lower cadence. But maybe just did not have enough strength to turn the big cadence and break through the wind, getting speed and inertia, which will relieve the ride.